Dr. Tony Tanaydin of LodeStar Inst. located in Raleigh, North Carolina, has been appointed by Dr. Patrick Gallagher, Deputy Director of the Commerce Department’s National Institute of Standards and Technology (NIST), to the 2009 Board of Examiners for the Malcolm Baldrige National Quality Award. The Award, created by public law in 1987, is the highest level of national recognition for performance excellence that a U.S. organization can receive. As an examiner, Dr. T. is responsible for reviewing and evaluating applications submitted for the Award. The board is composed of approximately 500 leading experts selected from industry, professional and trade organizations, education and health care organizations and government. Those selected meet the highest standards of qualification and peer recognition. All members of the board must take part in a preparation course based on the Baldrige Criteria for Performance Excellence and the scoring and evaluation processes for the Baldrige Award. Awards may be given annually in each of six categories: Manufacturing, Service, Small Business, Education, Health Care, and Non-profit. Awards have been presented to 77 organizations, including the (2008) Award recipients: Cargill Corn Milling North America, Iredell-Statesville Schools, and Poudre Valley Health System. Information about the Baldrige National Quality Program and the application process is available from the Baldrige National Quality Program, National Institute of Standards and Technology, Administration Bldg., Room A600, 100 Bureau Drive, Stop 1020, Gaithersburg, MD 20899-1020, telephone: 301/975-2036, fax: 301/948-3716. 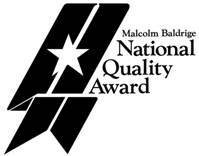 Information also can be found on the Baldrige National Quality Program's website at http://www.nist.gov/baldrige. The Award Program is managed by NIST in close cooperation with the private sector. The American Society for Quality (ASQ) in Milwaukee, WI, administers the program. For further information about Dr. T. contact 1.919.772.1132. For further information about the Baldrige Award, reporters may contact Michael E. Newman, NIST Public Affairs Office, 301-975-3025, michael.newman@nist.gov.